Originally, this article series was commissioned by WebyShops, but in the time since they changed their name to www.1800GunsAndAmmo.com The various sections appear on their website and other electronic publications. Writing this took a lot of time and effort and would not happen without their support. I have since edited and modified a fair bit of it and will continue to do so in the future as appropriate. The latest revision is in the works and should be wrapped up around the end of 2016. Essentially, this is a living document. Feel free to link to this article, but please do not copy any part of it anywhere without explicit permission. Introduction: What is a Riflescope? Which configurations work for different applications? Mechanical Quality: they all kinda look the same, is there really a difference? Optical Quality: good glass, bad glass, it’s all the same, isn’t it? Is there a sweetspot in riflescope pricing? Should there be a relationship between the price of the scope and the price of a rifle you mount it on? After all is said and done, how much should you spend on a riflescope? This may sound like a silly question, but bear with me. There is a method to my madness. To a shooter, it is a weapon sight. It is supposed to be slapped on top of a weapon, sighted in and used for its intended purpose: aiming. To an engineer, it is an opto-mechanical device that is used for aiming. Nowadays, it is not even always a pure opto-mechanical device since quite a few riflescopes have some electronics in them (reticle illumination, for example). The distinction is important: to a shooter, this is just a means to an end. To an engineer, there are a lot more details to it, and the “means to an end” may be something else entirely. An engineer tasked with designing a riflescope should have a pretty clear idea what it will be used for and what kind of abuse it is likely to be subjected to. He has to design it to withstand all reasonable (and sometimes unreasonable) abuse, while staying within other design requirements pertaining to size, weight, optical performance and, last but not least, budget. This last requirement is the reason behind most compromises made in riflescope design. A shooter trying to select the right scope often ends up considering very different factors. Typically, he will have an idea of how much he wants to spend and a rough idea of what the overall configuration should be. However, all too often, a shooter is blissfully unaware of the challenges that an engineer faces in designing riflescopes. That is not necessarily a bad thing, since getting into the nitty-gritty of technical details is often counterproductive. However, some basic knowledge of riflescope construction is very useful, especially if you are looking for a scope on a budget. If you have unlimited funds and can drop somewhere in the neighborhood of $3k or thereabouts on a riflescope, you are paying for not having to worry about any of that. For that much money, it better be bloody perfect! For the rest of us, a little consideration goes a long way. What is your budget? How much are you willing to spend (keep in mind that you also need good quality rings and bases)? What will be the basic application for the scope? Hunting? Target shooting? SHTF? Law Enforcement? etc. What are the extremes of the lighting conditions you are likely to run into? Is low light performance critical? What are the weight limitations? Is this going onto an ultra-light rifle that you plan to drag all over some distant mountains with you, all the while cursing every extra ounce you have strapped to your back? Or are you mounting this scope on top of a fifteen pound varmint rifle that gets moved twice a day on a good day? What is the likely target size? You do not need much magnification to aim at something the size of a grizzly bear. However, aiming at a prairie dog barely sticking out of the ground is an entirely different story. What are the likely weather conditions you’ll face? If you live in a climate where mirage can be a factor, you need to take that into account. Similarly, unusually wet climate creates its own set of problems. How much recoil will the riflescope (and the shooter) be subjected to? All of these questions are important in picking the right scope and, most importantly, picking a high quality scope for the right price. Today, there are high quality riflescopes manufactured all over the world: Germany, Austria, Romania, Czech Republic, Japan, Phillipines, Korea and China. There are also quite a few “less than worthwhile” scopes out there, most of them manufactured in China. Price ranges from $20 scopes that might as well be disposable to $7000 masterpieces of optomechanical engineering that are as near to a family heirlooms as scopes get (for the record, I do not condone spending that much money on a scope unless you have extra cash to burn). The sheer number of different riflescopes available in the market place today is staggering. Some are “me too” products, while others are true innovations. Some are narrowly focused on one particular application, while others are designed to be allrounders. On top of all that, innovative designs of just a few of years ago, look like perfectly ordinary items today. However, the basics of rifle scope design and construction do not change much, so the subsequent sections hold equally true to virtually all riflescope regardless of when they were manufactures. Any specific scope recommendations, on the other hand, need to be re-evaluated with reasonable regularity. Configurations: what do all those numbers mean and which one is right for you? also, please note that on most scopes, the eyepiece contains some sort of a reticle focus adjustment. In picture 1 above, it is the so-called “fast-focus”, which looks like a ring at the very back end of the eyepiece. In picture 2, the whole eye-piece rotates, and the lock ring that keeps in place once adjusted is right behind the magnification ring. Whichever type of the mechanism it is, the function is the same: to make the reticle look as sharp as possible. It is important to remember that the eyepiece focus is NOT for making the image as sharp as possible; it is for focusing the reticle ONLY. Just to be thorough: 3-9×40 means that this is a variable magnification scope with a 40mm objective lens and with magnification ranging from 3x on the low end to 9x on the high end. Similarly, the 3-18×44 scope has a 44mm objective lens diameter and magnification range from 3x to 18x. Magnification range is often described by the “zoom ratio” or “erector ratio”. For example, in a 3-9×40 scope the zoom ratio is 3x, other common zoom ratios are 4x, 5x and 6x, although there are now scopes with even larger magnification ranges. Naturally, not all scopes have variable magnification. While they are not as popular as they used to be, quite a few riflescopes out there have fixed magnification. The most popular configurations of this type are 4×32, 6×42 and 10×42, although there are others. As far as other specs go, first, there are the obvious ones: overall length and weight. Then there is the maintube diameter. There is a number of different maintube diameters out there. The most common ones are 1 inch (25.5mm) and 30mm (in the pictures above, the somewhat larger scope is 30mm). However, there are also 7/8 inch, 26mm, 34mm, 35mm and 40mm scopes. I am sure that someone out there has made, at one time or another, scopes of other diameters. A natural question here is why are there so many different diameters out there? Most of the differences are simply due to historical reasons: different standards arose in different parts of the world. However, for some more complicated designs it helps to have a little more space inside the tube. For example, most scopes with higher erector ratios are built on 30mm or larger tubes. Selecting a correct scope for a particular application mostly requires common sense. For the time being, I will leave out price range and optical quality. For the most part, I will concentrate on the configuration only: magnification range, objective lens diameter, etc. Here is the common sense part: if most of the time you plan to shoot at very small targets very far away, you need a rather large scope with high magnification. Here is another common sense argument: if you do not expect to run into these long shots with any regularity, you need an “allrounder” scope of some sort. Most people tend to overscope their rifles, by that I mean that they pick scopes too large in size and too high in magnification for their usage. As a matter of fact, there are not all that many applicaitons that require very high magnification. I often run into an argument that “if faced with such a shot once in a blue moon, it is better to have all that magnification available”. While sounding good on the surface, the truth is that most scopes that give you high magnification are not well suited for anything else. On the other hand, there are quite a few all-round configurations that allow you to take those long shots in considerable comfort. I suppose, what I am trying to say here in such a round-about way is very simple: when in doubt, err on the side of more conservative configurations. Besides, think of it this way: an object that is 300 yards from you, when viewed through 6x magnification appears to be about the same size as an object at 50 yards looks to the naked eye. The implication is that for most reasonable shots, 6x is more than enough and often less is more. The most common configurations for big game hunting rifles are “mid-range” scopes such as 3-9×40 and 2.5-10×40, and for good reason. These are fairly easy scopes to build with the low magnification offering enough field of view for close up shots and high magnification being sufficient to clearly aim at a deer-sized animal pretty far out. Definitely further than most people have any business shooting at an animal. Here, it is important to keep in mind that a hunting scope is not an observation device. That is what binoculars and spotters are for. A riflescope is there to allow you to clearly see the target and aim at it; being able to resolve every little detail of the target is not necessary for a weapon sight (although it does not hurt if other properties are not sacrificed). Additionally, most scopes of this configuration are fairly light and can be mounted sufficiently low to not upset the balance of the rifle. Things change of course once the application becomes a little less general. Some hunting is done high up in the mountains where very light rifles are often preferred (of course some people prefer very light rifles for all big game hunting). In those situations, 3-9×40 or similar is still a very good configuration to go with, but it is worthwhile to find a fairly light scope so configured. Some 3-9×40 scopes are distinctly lighter than others. Alternatively, you could go with a “tweener” scope of some sort for a mountain rifle. Tweener scopes are 2-7×32 and similar designs. They give up a little magnification compared to 3-9×40, but are lighter and offer wider field of view at the low end. Because of this wider field of view, tweener scopes are also well suited for hunting in densely forested areas where long shots are not typical. On the other hand, if most shots you take will be pretty long (western plains game hunting, for example), you might want a touch more magnification than a typical 3-9×40 scope provides. However, you still do not want to sacrifice too much field of view. For this, I’d be looking at scopes of following configurations: 4-12×42, 3-15×42, 4-16×42, etc. atmospheric and lighting conditions that allow usage of magnifications above 15x or so are pretty rare where I live. Even in categories where I recommend high magnification variables, I mostly keep them below 15x. Higher magnifications are really useful for reading the conditions though even when you can’t easily use them for shooting. 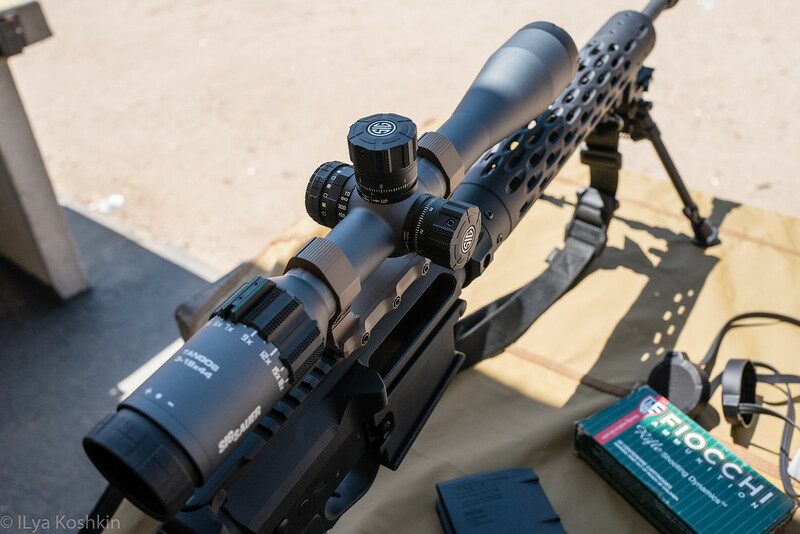 for long range applications you need scopes that have a large reticle adjustment range (70MOA/20mrad or more) and finger-adjustable exposed turrets. most of my recommendations above are somewhat generalized and within each application type there are further divisions. For example, some target shooting disciplines almost exclusively use ultra high (often fixed) magnification scopes. So far, all the riflescopes I mention are “focusing” optical instruments. What that means, is that the scope re-creates an image of the object in front of it somewhere (there are a couple of focal planes inside the scope where the image is re-created). Then that image is effectively “cast” back out by the riflescope’s eyepiece for your eye to pick up and re-create again on the retina of your eye. The distance where your eye has to be to pick-up the entirety of the image is called “eye relief”, and it is typically between three and four inches (75 to 100mm). In order to see the image presented by the scope, your eye has to be in a specific spot behind the riflescope. There is some leeway to the eye position (sometimes referred to as “eyebox”), of course, but if you happen to place your eye too far off, you won’t see much. Non-focusing sights are the ones that do not have that eye positioning limitation, but they also do not offer any magnification. These are non-magnifying sights that include various red-dot and holographic sights. There are a few 1x (unity magnification) focusing scopes out there that are usually identified as 1x prism sights. They have pretty flexible eye position requirements, but they are still not quite as lenient in that regard as true non-focusing sights. They do offer some significant advantages for people with astigmatism. Red-dot and holographic sights are designed for super-fast target acquisition with both eyes open and work well for close-range tactical applications. These are the sights your most frequently see in pictures from Iraq and Afghanistan mounted on the army issued M4 carbines. 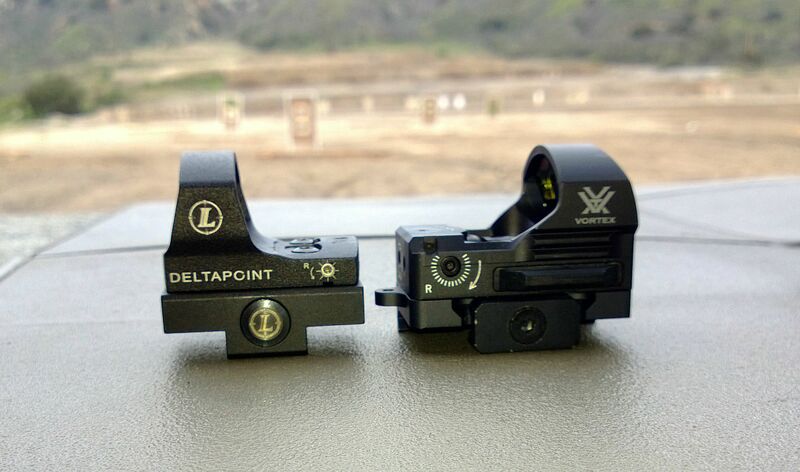 US military issues a large number of Aimpoint red-dot sights and Eotech holographic sights. They represent the two most common types of non-focusing sights out there. Since the success of these two brands, many others jumped into the fray. In terms of the battle of technologies, red dot sights (aka reflex sights) are by far the more prolific. Holographic sights, in principle, represent some very interesting advantages in terms of complex reticle designs and use with magnifiers. However, holographic sights have small lasers inside, while reflex sights use LEDs. That gives reflex sights substantial advantages in battery life. While they did not start out that way, as of 2016, there are dozens of reflex sights out there that you can leave on and expect the battery to last for a couple of years. Reflex sights can also be made smaller and, personally, I strongly prefer compact red dot sights to the full size ones. Holographic sights, on the other hand, work better with magnifiers and offer some other advantages. Ultimately, it comes down to what you prefer. Effectively, all you are trying to do with a sight like this is look through a short tube that makes up its body. If your eye is positioned along a straight line behind the sight (or close enough to it), you’ll see a red dot, which is your aiming point. In order to have reasonably fast target acquisition, the dot is pretty large (although this varies between models). Unfortunately, a large dot that aids target acquisition also makes it harder to shoot accurately at longer ranges. Still, a red dot sight is easily good enough to shoot deer-size targets within 100yards, and, in the hands of a skilled shooter, a fair bit further than that. With the Eotech, you are looking through a holographic screen and, in some circumstances, the reticle can appear pixelated which some people find distracting. However, on balance, both Aimpoint’s large dot and Eotech’s circle-dot are very effective. In recent years, in order to extend long range capabilities of red-dot sights, a few companies introduced magnifiers. These are essentially short monoculars with 3x or 4x magnifications that can be placed immediately behind a red-dot sight. When not in use, they can be either removed or flipped aside. If I try to list all of the possible scope mounting screw-ups I have seen over the years, this will be a very long (and likely very boring) section. Even a very nice scope, if improperly mounted, will not work very well. Pretty much any modern rifle comes set-up for scope mounting in some way. It is either configured with a grooved receiver for proprietary rings (CZ, Tikka and Ruger for example) or drilled and tapped for bases of some sort (just about every other maker). Problems can start with something as simple as the holes in the receiver being slightly misaligned from the factory, which in turn causes the rings to be misaligned thereby putting undue pressure onto the scope tube. Then there are the potential problems with improperly machined rings and bases themselves. All of that is pretty well known, but I still often see people getting $5 rings for their $500 scopes. If that is not “asking for trouble”, I do not know what is. Reasonably well-made rings and bases can be had for as little as $30-$40 with prices going all the way up to $200-$300 for fancy quick-detachable designs. Whichever version you decide to get, it helps to check and make sure that the rings are concentric (there are kits available for that or a gunsmith can do it for you). Oftentimes, it also helps to epoxy-bed the bases to the receiver. If the rings are not concentric, they should be lapped (once again there are kits available for that). Alternatively, if you do not need a quick-detachable mounting setup, Burris Signature Zee rings have self-aligning plastic inserts that take care of ring alignment problems. There are quite a few different mounting systems out there and most of them, if properly executed, are equally suitable for most applications. One exception to that is the so-called “universal” or “standard” system that has a dove-tailed front ring and windage-adjustable rear ring. In this set-up, the brunt of the recoil is absorbed by the front ring alone, so I do not recommend this system for hard-kicking rifles. If you choose to mount the scope yourself (and it is generally not very difficult if you have the right tools), make sure you know the torque specifications for both the rings and the bases. Some manufacturers have that information on their website, while with others you may have to give them a call. This is probably the most common problem I see with scope mounting: overtightened rings. I have seen scope tubes crushed to the point of permanently mangling the scope. In more mild cases, overtightened front ring prevents the side-focus knob from operating properly. Combination of overtightened and mis-aligned rings can cause most scope adjustments to seize-up completely. Bottom line is that if you plan to mount your scope yourself, pay attention to little details; it can save you all sorts of headache later on. Cheap scopes, on average and assuming the same configuration, are less durable and reliable than their more expensive brethren (although mid-range scopes are not necessarily any less durable than the expensive ones), have less precise adjustments and are prone to other mechanical problems. Now, I am mostly talking about really cheap scopes here. These days most scopes from the mid-price range onward are quite good, but that of course depends on the application and on the user’s expectations. Oftentimes, it is difficult to generalize about the quality of a particular scope. Besides, there are exceptions to all generalizations, and naturally, those are the ones that people remember. It is an unfortunate consequence of producing anything mechanical that there will be occasional flawed samples that make their way through QC (quality control). Typically, part of the price you pay for an expensive scope goes toward more extensive QC, but regardless of how expensive, all things mechanical can (and occasionally do) break. There is no way to guarantee with 100% certainty that any particular scope will be both repeatable and reliable, but common sense suggests that we can come up with some reasonable guidelines. Bottom line (and this is going to be a rather recurring theme) is that if the riflescope configuration that you are looking at is difficult to make, consider spending more money. Affordability and complexity simply do not make a good combination. Moreover, keep in mind that something considered difficult to make twenty years ago is not considered to be all that difficult today, so this is a moving target of sorts. However, the general principle holds: it you are looking at a $300 scope with the same feature set as the latest and greatest $4k instrument, chances are that you are trading away some mechanical quality for all those features. In terms of the mechanics, the things that are hard to make are somewhat self-explanatory, like the high zoom ratio designs that are so popular now: 3-9×42 is easier to get right than a 3-18×42. Similarly, the higher the magnification of the scope, the tighter the positioning tolerances for the mechanical elements are. Then there is a case of somewhat misplaced expectations: for example, most hunting scopes are intended to be used in a “set and forget” mode. One implication of that is that the adjustments, although marked 1/4MOA, may not be exactly that. They might not even be very uniform or very repeatable, but, once the scope is sighted in, if the point of aim does not move then the scope works as intended. Finally, there are the economies of scale to take into account: if a particular design has been made for some time and in volume by a reputable maker, it is likely that most of the kinks have been worked out. Operationally, the simplest scope I have is a rather old (made in the 1980s) Israeli Nimrod 6×40. It has a grand total of two adjustments: elevation and windage knobs. All these knobs do is move the internals of the scope slightly in order to change the position of the reticle. 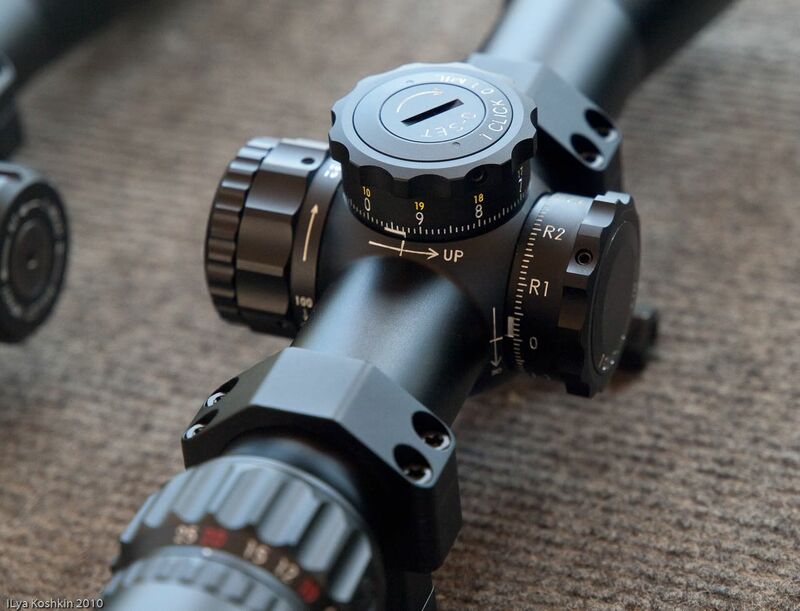 For the most basic of scopes you use the windage and elevation knobs to dial in the Point of Aim (POA) of the scope to coincide with the Point of Impact (POI) of the rifle. Additionally, if the elevation knob is set up for it, you can use it for trajectory compensation when shooting at extended ranges. That is the case with this old Nimrod scope. Most modern scopes, even the very inexpensive ones, have more controls than that. First of all, since vast majority of scopes currently made have variable magnification, they also have a magnification or zoom ring, rather predictably located at the forward end of the eyepiece. In the picture below, it is a wide rubber-covered patch that has a the magnification numbers right next to it (the scope is Minox ZA-3 3-9×40 and is set to 9x magnification). As far as other controls go, this scope also has an eyepiece focus, which is located right at the tail end of the eyepiece (in the picture, it is on the right-most end of the scope next to the “+|-” markings on the scope). The eyepiece focus exist for one reason and one reason only: to make the reticle look as sharp as possible to your eye. It should never be used to focus the image, only the reticle. In effect, it allows you to adjust the scope to the peculiarities of your eyesight. Ideally, you should set the eyepiece focus once, when you first set the scope up and not touch it unless your eyesight changes. The scope configuration in the picture above is probably the most common one for modern big game hunting scopes. You can adjust windage and elevation (i.e. change the POA via the position of the reticle inside the scope), magnification, and eyepiece focus. Higher magnification models often add some sort of an image focus adjustment. Image focus adjustment works via one of three means: adjustable objective (AO), side focus (SF), or rear focus. All three acomplish the same task: get the image as sharp as possible and reduce parallax. All three work equally well when properly executed. Unlike the eyepiece focus, this is the adjustment that gets used every time a target at a new distance is engaged. The first two are the more common methods. Rear focus is only used on a couple of scope lines I am aware of and only for fixed magnification scopes. For those designs, image focus adjustment is in the same spot where magnification ring would have been otherwise on variable scopes. In principle, AO is somewhat more fragile than Side or Rear Focus; however, in practice, I found that there is little difference between them except for the obvious: location of the control. Depending on the shooter and shooting position, one may be more comfortable than the other. For example, for left-handed shooters, AO and rear focus tend to be more convenient than Side Focus. For a lot of right handed shooters, Side Focus is the most conveniently located option. Lastly, there is the reticle illumination control. This comes in a bewildering array of shapes and sizes. Most frequently it is an additional knob you can turn, that is placed either on the eyepiece or on the turret box (for scopes without side-focus). In some designs, reticle illumination control is integrated into the side-focus knob or, more recently, simply consists of a couple of pushbuttons on the turret box. For fast majority of the scopes equipped with the reticle illumination, there is a way to adjust its brightness. One hand, that is a good thing, since different lighting conditions require different illumination levels. On the other hand, it is a bad thing since most manufacturers (especially the inexpensive ones) get the illumination levels totally wrong and generally screw up on reticle illumination execution with alarming regularity. For night time, the reticle illumination illumination should be very faint, otherwise it effects your night vision. For day time use in bright sun (to speed up target acquisition for example), in order for the illumination to be visible, it has to be very bright. Vast majority of illuminated reticles out there satisfy neither requirement, so make sure you look into that when choosing a scope. Here is another general rule of thumb: if you want properly executed reticle illumination, prepare to spend a fair amount of money on your scope. There is one company that effectively made its name largely because it developed an unusual and highly effective method of illuminating the reticle: Trijicon. These scopes use a combination of fiber optics and tritium illumination for a, largely, self adjusting brightness level. If your application really requires reticle illumination at a sub-$1000 price, Trijicon should be on your short list of companies to look at. Talking about durability of rifle scopes typically results in opening a major can of worms, so I will keep it short and to the point. Durability refers to how well the scope holds up to being used over time, i.e. a durable scope’s performance does not change in any perceptible manner as it is used. Repeatability refers to the consistency of controls and adjustments. Technically, neither good durability nor good repeatability guarantees that a scope is going to work well, since neither one guarantees precision and accuracy. A scope can have uneven reticle adjustments, click value can be off, POI can change with magnification. However, for as long as it maintains this behavior without deteriorating or changing, the scope is both durable and repeatable. In order to make it a good scope, it also has to have adjustments that perform to spec. Durability is very difficult to discuss since it is by nature a statistical parameter. Only the manufacturers have access to the statistics of how many of their scopes break (and are sent back to them). All the information we typically have is simply anecdotal evidence that is rarely statistically significant. All things mechanical can and do break occasionally. If one scope breaks, it is not necessarily an indictment of the rest of that product line. However, if the person whose scope broke is vocal enough, he can create enough reverberations on the internet to blow up the problem. That having been said, in many cases there is enough anecdotal evidence to provide valuable information. For example, one brand that recently emerged with particularly obnoxious advertising is certifiable junk. The brand I am referring to is “Counter Sniper Optics” and this is a case where there is enough anecdotal evidence to make it statistically important. Still, by and large, all we have to go on is word of mouth and that tends to be dominated by a few “loud” voices. Over the years, I have managed to coerce a few manufacturers into privately disclosing their return rates, but I swore to keep that information private (and I will not break that promise). All I got out of that is a simple fact that mid-range scopes are typically well-made. What makes things even more complicated is a simple fact that many riflescope designs go through small quiet changes that are never disclosed to the customer. For example, it is not uncommon for a new product to reveal a design flaw during the first few months on the market. As soon as the maker learns of this and does appropriate Failure Analysis, the design flaw gets fixed. However, if the owners of original faulty scopes are loud enough (and if the manufacturer is dumb enough to provide less than stellar customer service in today’s competitive market place), the reputation of the whole product line can end up tarnished. Then there are the different failure modes: if your scope is going to fail, you want it to fail catastrophically, so that you know right away something went wrong. The worst kind of failure is the gradual decline in precision and repeatability, since it is often difficult to diagnose until it is too late. Bottom line is that if you want to avoid surprises, check your scopes periodically for precision and repeatability of adjustments. Lastly, there is a case of unreasonable expectations (yet again). I expect every scope I have to be durable. If it does not hold zero, it is a paper weight, not a scope. However, if it is a truly inexpensive piece, I do not have very high expectations on repeatability, so I do not mess with the adjustments too much. The more I pay for the scope, the more I expect from it. By the time we get to mid-price scopes ($500 to $1000), I do not expect any nasty surprises. For the truly high end stuff, I expect everything to be flawless, since I have just paid twice more money for 10% more performance. The rest of that extra price tag goes into QC. No, it is not the same. Not Quite. All you have to do to confirm that is get a couple of scopes with widely differing price tags but similar configurations and look through them side by side for a few minutes, preferably under some sort of challenging light conditions (not inside a gun store). However, comparing a $100 scope to a $3000 one sure looks like a rigged election, and it is. For products that are closer in price the differences are often quite small. Some companies offer more for the money than others, but overall, you get what you pay for. I’ll cover that in more detail further on, but, for the time being, it is worthwhile to talk a little bit about optical quality and image quality. A lot goes into making a riflescope with good optical quality: system design has to be properly worked out, all of the optical components have to be shaped and polished to very high standards, coatings have to applied both correctly and consistently, etc. However, from an end user perspective, none of those details by themselves should be of any interest. Still, I see internet discussion all over the place on how a particular scope features glass X which must be totally superior to glass Y. These discussions are largely a testament to how successful marketing departments of large equipment makers in diverting their customers’ attention from what is actually important and toward the useless, but cool-sounding details. I am not saying that the materials used are unimportant. They are important. However, they are not directly important. Moreover, the choice of materials is driven by the overall system design and no matter how high the quality of a particular piece is, it has to be used correctly. On top of that, some other part of the optical system may be the limiting factor. For example, there are three separate optical systems inside a typical riflescopes, eyepiece, relay and objective. All three are equally important, but if the eyepiece is badly designed, for example, it makes no difference how phenomenally good the objective lens system may be and vice versa. On top of that, as end users of the product we really do not know enough of the technical details of what goes into a particular scope to be able to make any sense of whether they matter or not. Once in a while, during a candid conversation with a scope maker they mention something that is actually worthwhile, but then they usually ask to keep this information private (and I understand why). Bottom line is that, first and foremost, we should be looking at the overall image quality of the product. Otherwise, we run the risk of “focusing on the trees so much, that we lose sight of the forest”. When it comes right down to it, the only truly relevant question about the optical quality of a riflescope is the following: “will you be able to see your target well enough to comfortably make a shot at all possible lighting and environmental conditions you might encounter?” If the answer is “yes”, do you care about how the scope maker achieved this? Unless you have a lot of money to spend on a scope, the answer is likely to be “no”. Then you just have to look and see which scope within your budget gets you the closest to “yes”. How the scope maker achieves that is still not especially relevant. On the other hand, looking at this from the standpoint of those trying to sell their products in a very competitive market place, I can see why the advertisement campaigns we see are designed the way they are. After all, if you make a mid-range riflescope that is not very different from a half-dozen of your competitors, how do you make it stand out? You have to zero in on some sort of a differentiating features that touch on both optical and mechanical qualities of the product. Mechanical features are fairly simple: different knob and other control designs are easy to photograph, describe and put into an ad. How do you sell good image quality? Every magazine ad for every scope company for a riflescope talks about how well you can see. You pretty much have to tout something: patented coating recipe, extra low-dispersion glass, “high definition” glass, etc. None of these things by themselves are of any importance and (by my estimate) nearly 100% of what you see in a typical advertisement is, at best, misleading and at worst, pure BS. However, all these tricks are necessary for attracting enough attention to a particular product to at least get you to consider it. Going forward, I’ll discuss a few things I look at when I evaluate a riflescope’s optical quality. I am not going to spend much time on scientific definitions of those terms. I think it is more pertinent to look at how they effect a scope’s performance. First of all, I think it is worthwhile to define these two terms, if briefly, since they sometimes are confused with each other. Both refer to the image quality and are influenced by a number of optical design parameters. However, in order to evaluate resolution and brightness, you do not need to know anything about the scope’s construction. All you have to do is look through it and pay attention. Resolution is simply the ability of the scope to distinguish small details within the image. Contrast is the ability of the scope to faithfully transmit the difference between light and dark (and by extension color fidelity and saturation). I have heard people say that resolution and contrast go hand in hand. That is not, strictly speaking, correct. They are in a perpetual match of “tug of war”. It is impossible to optimize both of them to be as high as possible. If resolution is fully optimized, contrast suffers, and vice versa. In an image with high resolution, but low contrast, there may be a lot of fine detail, but you might have a hard time distinguishing between them, since they do not stand out much. Conversely, if an image has high contrast, but low resolution, all the large details will be very distinct (a common term is to say that they “pop” out at you), but small details will simply not be present. While ideally you would want to have an image with both high contrast and high resolution, that is not easy to achieve. For every optical system, the designer has to compromise between resolution and contrast in order to achieve a well-balanced image. Moreover, a riflescope’s contrast and resolution are typically not the same in the center of the image as they are near the edges. The term “sweetspot” usually refers to how large of a spot in the center of the image delivers consistent resolution and contrast (and a few other things). Historically, different companies chose to compromise between resolution and contrast in different ways. For example, between the “alpha” makers, historically, Zeiss used to always put a little more emphasis on resolution, Leica on contrast and Swarovski on sweetspot size. In practical terms, they naturally tried to get everything as well optimized as possible, but they simply had slightly different ides of what the “optimal” compromise is. In recent years, as the optical quality keeps on getting better and cheaper, there is some convergence between the compromises made by top end companies anyway. That is one of the reasons why some people prefer image quality of scopes from particular companies: since we all have different eyes, we are sensitive to different things. Some, for example, are so sensitive to contrast, that a very well resolved image might not look all that good to them due to somewhat muted contrast. Personally, I adjust to contrast differences pretty well, but my eyes favor (somewhat) high resolution and wide sweetspot (hence my affection for Zeiss riflescopes and Swarovski binoculars). Moreover, the relative importance of contrast and resolution sometimes changes as the light gets low. In bright daylight, when the objects you are looking at are naturally very contrasty, even if the scope diminishes that contrast very well, you are still likely to see details pretty well. However, as the light gets low, if contrast is insufficient, fine details start blurring pretty quickly, and even large details become hard to see. They just do not stand out as much. In order for low light performance to be good, both resolution and contrast have to be up to par (and that is one of the reasons you get what you pay for). Lastly, I’ll briefly mention MTF. MTF stands for “Modulation Transfer Function”. I see this term misused in all sorts of discussions related to sporting optics. MTF is, in essense, a composite measure that describes how well a particular optical instrument maintains contrast at ever increasing resolution and with respect to spatial variation within the image. Just about every optical design goes through some sort of MTF optimization, and a lot of the potential performance of an optic can be gleaned from its MTF curves. In principle. In practice, since the peculiarities of our eyes are not accounted for, there is no replacement for looking through the riflescope in question. Three years of digging through specs and curves will not replace 20 minutes of messing with the actual product. If you are interested in more technical details on MTF, resolution and contrast, there are all sorts of wonderful online resources available: Wikipedia, Norman Koren’s website, etc. Just do not expect a whole lot of practical and applicable insight from them, since they are primarily focused on the photography applications, where image acquisition is accomplished via a well-characterized imaging sensor, not your eye. Bottom line is that all optical designers pay attention to MTF and optimize it the best their budgets allow. There is really not all that much directly relevant information that I can say about coatings, but it is useful to know why they are important. There are all sorts of coatings used in modern optical devices and for a number of different things. However, in the context of riflescopes, when someone says “coatings”, they usually mean anti-reflective coatings, often shortened into ARC or “AR Coatings”. These coatings minimize the reflections at every air-to-glass interface. If you happen to be looking at a riflescope that has both lenses and prisms (like Trijicon’s ACOG, for example), then the lenses have AR coatings on them, while the prisms, depending on which surface you are looking at, will have either Anti-Reflective coatings, or High-Reflection coatings (one of the surfaces of the roof prism). However, for the sake of this discussion, I will stick to AR Coatings. First of all, there is the natural question of why we need these coatings at all. In reality the calculation is not as simple as that since there is some wavelength (color) dependence involved in addition to other considerations, but even if this is a “back of the napkin” approximation, there is still a lot more light getting through when decent coatings are involved, ~30% difference in this case. Pretty much all modern scopes employ AR coatings of some sort, so when you compare them the difference in total light transmission is likely to be not huge. Perhaps more importantly, your eye is very good for adjusting to these small differences in total amount of light that the scope delivers to it. In modern scopes, total light transmission is not directly important. As a matter of fact, it is a lot more important to know how much light gets reflected than how much gets transmitted. While your eye does not care too much about light transmission, it cares about image fidelity a great deal. If there are strong reflections somewhere within the scope, you can run into a situation where there all sorts so of reflections bouncing back and forth inside the scope. Some of that secondary reflected light eventually makes it to your eye and your brain finds it more difficult to make sense of the primary image. On the surface, it seems like the strength of that secondary reflected light is a fraction of a percent of the original imaging getting through the scope, but under some conditions, it can have quite an effect on the image. For example, imagine you are trying to take a shot at a shaded target some time around sunset looking toward it. As you look through your scope, you have both the shaded target and the very bright setting sunlight in your field of view. Because the bright sky during sunset is so much brighter than what you are actually aiming at, even a weak reflection can be sufficient to seriously degrade how well your eye resolves the target itself (this is a type of optical flair, which I will touch on in the next section). Riflescope advertising often proudly touts a high light transmission ratio of a particular scope. Higher light transmission (i.e. fewer reflections) is usually a good thing, but it should be looked at in proper context. Image quality is highly dependent on how sophisticated the optical design of a scope is, and top notch designs often require more optical elements than simpler ones. With so many lenses inside the scope, the overall light transmission might drop a little (remember each extra surface reflects some extra light), but the image quality of that scope is likely to be higher than that of a similar scope with less sophisticated (i.e. fewer lenses) design, if they use the same AR coatings. The best example of that is offered by two, no longer available in US, Kahles scopes that I had a chance to compare side by side: Kahles CL 3-9×42 and Kahles KX 3-9×42. Both are excellent scopes, but the more expensive CL has an extra lens in it. Otherwise, these are very similar designs that use identical coatings (Kahles’ AMV). KX had slightly higher light transmission, while CL has higher overall image quality. Lastly, there is the matter of objective lens diameter to address. I often hear people say that because scope X has larger objective lens than scope Y, it has higher light transmission. That is not necessarily correct. A scope with a larger objective lens lets more light into the scope. However, light transmission is a ratio that is normalized with respect to the amount of light entering the scope. Hence, while a scope with a larger objective lens may very well deliver more light to your eye, light transmission ratio is no tin any way effected by it. Stray light is exactly what it sounds like. It is, quite simply, light that strays into the image from all sorts of different sources and that is not intended to be there. It is the unwanted light. Optimizing stray light performance of the scope is, often, one of the more important final touches in the design. If you look into the objective lens of a high quality riflescopes, you will note that all the metal surfaces inside look like they were sandblasted and blackened in some sort of a non-flaking way. If you pay attention you might also see some slight baffles that are strategically positioned to block off some off-axis light. Bottom line is that figuring out how to deal with stray light is mostly a problem for an optical designer; however, there are a few thing a shooter can do as well, to alleviate some of the problems. No matter how much effort goes into suppressing stray light, all scopes are susceptible to it, although to varying degrees. First and foremost, if your scope came with a sunshade (metallic tube that can get screwed into the objective bell of a scope as an extension of sorts), use it. It might get in the way on a hunting rifle, when out in the field, but on other occasions, I suggest giving it a shot. Other than the scope being slightly longer, there is really no downside: it will either have no effect on the image, or it will make it better. While the name “sunshade” is generally appropriate, often times it is equally useful, when there isn’t much sun visible at all. Anytime there are bright ligth sources outside the field of view, a sunshade is likely to help. Keep in mind that stray light can enter the scope through both the objective lens and the eyepiece, and putting a sunshade onto the eyepiece of a weaponsight is not feasible for a number of obvious reasons. However, putting rubber eyeshield on the eyepiece can work for rifles with low recoil or simply when a riflescope is used as an observation device (it also helps in filtering out unwanted light entering your eye). Even something as simple as wearing a baseball hat can help block some unwanted illumination. As far as scattering goes, there isn’t too much you can do about scattering except take care of the lenses: any dirt or scratches will create some light scatter, so if you want optimal performance, maintain your optics properly. Some scattering occurs simply due to imperfections in the glass, such as tiny air bubbles. However, it is not a major problem in scopes by reputable manufacturers. Lastly, flare deserves a few words. Flare is a type of stray light that is obviously visible. A lot of stray light simply degrades the image quality without creating any distinctly visible artefacts. Flare is usually easy to detect. The most common type is the veiling flare which, true to the name, looks like a bright curtain across all or part of the image. Veiling flare is usually caused by reflections within the objective lens system (and scopes with large objective lenses are especially prone to it). Other types of flair often show up as bright floating objects within the image and, depending on the type of illumination present, can have a color aspect to them. For example, some halogen light sources produce rather characteristic purple flare in many optics that has very little to do with real life performance, since that kind of lighting scheme is never encountered outdoors. Generally speaking, most issues related to distortion and aberrations in riflescopes are quite overblown, especially in the case of hunting scopes that are not used for extended observation all that much (or at least are not supposed to be used for extended observation). For a riflescope, it is important that whatever is in the center of the field of view is as sharp and clear as possible. The performance at the edges is comparatively less important. Since geometric distortion (itself a type of an aberration) and most other aberration types (with some notable exceptions) are present mostly off-center, they are a secondary concern from a shooter’s perspective. First of all, what is distortion? Technically, there are quite a few types of distortion in optical instruments, but radial distortion is of most relevance to rifle scopes. Essentially, it describes an instrument’s ability to show you straight lines: if lines that are supposed to be straight, look curved near the edges of the image (and the further from the center, the more curved they appear) you have distortion. There are two types of it: pincushion (lines curve inward) and barrel (lines curve outward). Most types of sporting optics actually build slight amount of pincushion distortion into the image in order to counteract the rolling ball effect when panning. Generally, a lot of variable magnification riflescopes have visible edge distortion at lower magnifications and, by and large, it is not very interesting. We aim with the center portion of the image, so whatever is at the edge is not all that important for as long as it is not strong enough to distract your attention from the point of aim. As far as optical aberrations go, they can be sub-divided into two types: monochromatic aberrations and color aberrations. I will not spend a whole lot of time on monochromatic aberrations. They include things like spherical aberration, coma, astigmatism, etc. For the most part these aberrations are a by-product of paraxial approximation in optical design and/or of the fact that most lenses have spherical surfaces. Paraxial approximation simply implies that when the original optical design was done, the designer assumed that the light rays are not going to deviate too much from the optical axis of the scope, and in most cases that holds true. However, some riflescope configurations really push the limits of this approximation, for example compact scopes with large objective lenses. Spherical lens surfaces have both strengths and weaknesses. Truthfully, they only have one advantage, but it is an important one: they are easy to manufacture very precisely. The main weakness is that the light that goes through the part of the lens that is away from the optical axis is focused at a slightly different spot than the light that is close to the optical axis. Hence, the larger the lens the more apparent this, appropriately named, spherical aberration becomes. Most modern scopes do a very good job of correcting for spherical aberrations, but if you stumble onto a scope with the image near the edges looking a bit out of focus, you are likely looking at some residual uncorrected spherical aberration. A lot of other optical aberrations are also a result of off-axis performance. By making lens systems a bit more complicated (i.e. by adding appropriately shaped lenses), a lot of the aberrations (including ones I did not mention here) can be corrected, but every extra optical element adds size, weight and cost. It also adds additional surfaces that can cause reflections. Just like everywhere else, there is no free lunch here. Color aberrations usually stem from the fact that most materials have different indices of refraction at different wavelengths. Refraction is the material property that makes lenses work: when light goes from air into glass, it changes direction a little bit (“bends”, for lack of a better word). How much light changes direction as it enters the glass is determined by the glass’ index of refraction. If we take into consideration primary colors only (blue, green and red), it turns out that for most typical glass, the refractive index for blue light is higher than for green light, which is higher that that for red light. That makes the focal length of the lens slightly shorter for blue light than for green (and red). For similar reasons, the image details of different color can end up reconstructed at different distance from the optical axis. Both of these effects are referred to as Chromatic Aberration (often shortened as CA). The effects of different focal length for different colors are called longitudinal CA, and the color-dependent variations in detail reconstruction around the optical axis are referred to as lateral CA. In riflescopes, CA is usually an artefact of objective lens system and can be largely corrected with sufficiently sophisticated design. It is also more prominent in higher magnification scopes where the tolerances are generally tighter and various aberrations are more visible. This is where Extra Low Dispersion (ED) glass comes in. When properly used, an addition of an ED glass element can help eliminate any noticeable CA from an optical system. The use of ED glass in riflescopes is not very prominent at the moment, but it is becoming more common. If you happen to need a riflescope with the highest possible magnification, it is worth your while to look at offerings with ED glass in the design. Both types of chromatic aberration (if visible in your scope) show up as colored fringed at the interface between bright and dark objects within the field of view. The actual color varies depending on the scope design. Red or violet fringes are most common, but I have seen CA of almost every color of the rainbow over the years. Lateral CA, as the name suggests, becomes most pronounced the further you get from the center of the image, while longitudinal CA is visible along the optical axis as well. My take on Chromatic Aberration in riflescopes, by and large, is the same as that on all aberrations and distortions: I want the center of the image (i.e. the aiming point) to be clear, sharp and as devoid of undesirable artefacts as possible. I am, however, far more forgiving toward edge effects as long as they are not strong enough to be distracting. Tunnel vision is yet another one of those contentious topics where people tend to disagree. Empirically, it seems that some people are bothered by it vastly more than others. My sensitivity to tunnel effect is directly proportional to riflescope price: I am willing to forgive some of it on lower priced scopes, but if I am shelling out some serious money, I get much pickier. What is tunnel vision? The effect is easier to witness than to describe. An extreme case of tunnel vision is like looking through a straw: the image appears far away from you and it looks narrow. The actual field of view might not be particularly narrow once you look at it carefully, but it looks narrow. This effect is frequently characterized by a thick black ring around the image, although that description is not necessarily accurate. I have seen some scopes with visible black ring around the image that had minimal tunnel effect. In those designs, the eyepiece was overbuilt and had housing so thick that you simply saw the rim of the eyepiece around the image. Tunnel effect occurs when one of the optical systems inside the scope has field of view wider than the limiting aperture in front of it. The most common occurrence of tunnel effect is due to the relay system seeing the inside of the metal tube that houses the erector lenses. On variable scopes, it is manifested by tunnel vision appearing at lower magnifications. It is not uncommon for a scope to be completely free of tunnel vision for the upper 70% of its magnification range, only to have the effect become progressively worse in the lower 30%. If you notice the black ring around the image become progressively thicker as you dial magnification down, then the relay system is at fault. The strength of the tunnel effect is determined by the optical design of the riflescope and by how you perceive it. That is one of the reasons you have to get your hands on the scope and look through it. There is nothing in the specifications or anywhere in the accompanying documentation that will tell whether this model has tunnel vision and, if yes, its severity. Determining low light performance of a riflescope is not nearly as simple as some make it out to be. On the other hand, it is not rocket science either. However, there is no substitute to field trial. If you want to be certain how good (or not so good) your scope is in low light, you have to try it out with your own eyes. Most of the problems in predicting how well a a particular scope performs in light starved conditions naturally stem from differences in individual eyesight. We all see things slightly differently in good light and in poor light these differences often become even more pronounced. The most obvious (and easy to observe) difference is in the size of your eye pupil. In good light, a human eye pupil contracts considerably, since there is plenty of light available. The amount of light that gets into your eye is directly proportional to the area of your eye pupil, so if during the day, your eye pupil has a typical diameter of ~2mm, its area is ~3.14mm2. As the sun starts setting and there is less light available, a few things happen. First of all, your eye adjusts to the decrease in ambient light and your eye pupil dilates in response. If it increases up to 4mm in diameter, its area becomes ~12.56mm2, or four times larger than it was during the day. So far so good, except the speed and magnitude of eye pupil dilation varies from person to person and is also effected by a number of other factors like dietary habits, age, time of day, etc. For a typical healthy human being under the age of 30, maximum eye pupil diameter is ~7mm when it gets really dark, but I have run into people with 4mm and 9mm maximum eye pupil dilation, so it varies greatly. On top of that, simple things, like how much coffee you have had on that day make a difference. Aside from the eye pupil changes, the way we process visual information also changes depending on how much light is available. There are two types of light sensitive cells in the eye: rods and cones. Generally, depending on the amount of light available, human eye operates on one of three different vision regimes: scotopic (ultra low light where only the rods collect information), mesopic (low light when both rods and cones collect information) and photopic (good light when the visual information is collected primarily by cones). Even in rather low light hunting, human eye seldom gets into the scotopic mode of operation, usually there is enough illumination for mesopic vision. As a general guideline, as the light gets lower, you know when mesopic vision starts when the colors start changing. When color disappears entirely, you are in the scotopic region. On top of the other complications, rods and cones are not evenly distributed in the retina. There is a region in the retina that is directly behind the iris called fovea. It is approximately 1mm in diameter and is responsible for most information collected by the eye. The problem is that there are a lot of cones in the fovea, but not a lot of rods. Hence, as the light gets lower and cones stop collecting information, you need to rely on light falling outside the fovea, which is greatly helped by larger exit pupil in your riflescope. The exit pupil is a function of scope magnification and objective lens. To calculate its diameter, divide the objective lens diameter by the magnification. For example, a 6×42 riflescope has a 7mm exit pupil. A variable magnification 3-9×40 riflescope has ~4.4mm exit pupil at 9x and it gets progressively larger as you lower magnification. In practice, with a 3-9×40 riflescope, you end up with the best low light performance at somewhere between 4x and 7x magnification, depending on how large your eye pupil gets and how low the light is. To know for sure, it is worthwhile to experiment. Aside from the exit pupil diameter, high image quality really helps. Human brain utilizes the images from both eyes to extract detail, but there is no binocular vision in riflescopes. However, keeping the off-eye slightly open helps. Also, images with higher contrast allow you to maintain some elements of color vision longer. That also helps your brain extract detail out of the picture. There are a few other things to consider as well. For one, in very low light you actually see a little better with the “corner of your eye”, so to speak. It is also easier to see moving details than stationary ones. In that case, it helps to have the exit pupil of the scope a little larger than your eye pupil. That way your eye can move a little without blacking out the image. Another factor is the change in the F/# of your eye as the pupil dilates. That causes the perceived depth of field of your eye to be quite a bit shallower in low light. Hence, eye distance behind the scope’s eyepiece becomes more critical. Moreover, in daylight, when cones are responsible for light collection, your eye is most sensitive to green-yellow part of the spectrum. In low light, as the rods in your eye starts to collect the bulk of the information, eye sensitivity shifts into the green-blue. That implies that some scopes with anti-reflective coatings well optimized for daylight will not perform all that well after sunset. On the other hand, a scope that looks decent, but not exceptional during the day, might look better than you thought at night. Once again, there is no substitute for experimentation. When all is said and done, keep in mind that for truly good low light performance, you need both high image quality and large exit pupil. If in doubt, err on the side of top notch glass. If the scope delivers just a bit extra light and higher image fidelity to your eye, a moderate exit pupil works surprisingly well in failing light. Tactical or precision shooting requires a completely different set of reticles as does target shooting. On top of that the same reticle will perform differently depending whether it is placed in the First Focal Plane (FFP) or Second Focal Plane (SFP) of the scope (more on this later). Then there is the whole issue of illumination. Reticle selection deserves a separate, detailed article. Rather than try to go over the minutia of every reticle available in the market, I will simply describe the steps in my thought process when I pick a reticle (and there are quite otherwise excellent scopes that I have passed on simply because I did not think the reticle fit my needs). I will also list a few reticles that are my personal favorites. STEP 1. Think clearly about the intended usage for this setup. Is this reticle going to be only used for aiming, or do you plan to also use it for rangefinding and/or holdover? This will dictate whether I want SFP or FFP reticle. If I only need the reticle as an aiming point, I want some sort of a simple and visible design, likely in the Second Focal Plane (further developed in STEP 2A below). If the reticle is intended to be used for rangefinding and holdover in addition to aiming, than I definitely prefer more complicated patterns in an FFP design (STEP 2B below). When the reticle is placed in the Second Focal Plane, it looks the same regardless of which magnification the scope is set on. When your turn the zoom ring, the image will either shrink or magnify; however, the reticle will appear to be the same size. It makes for a consistent aiming point, but reticle dimensions (compared to the image) are different and every magnification setting. When the reticle is in FFP, it shrinks and magnifies together with the image. Hence, reticle subtensions cover the same portion of the image regardless of magnification setting (very helpful for ranging). Also, if there are holdover points in the reticle, they will represent the same holdover values at ALL magnifications. Holdover reticles (like the Rapid-Z designs above) are very popular these days in SFP scopes. The way they work is as follows: since relative reticle dimensions change with magnification, you tweak your scope’s zoom ring until the reticle subtensions work for holdover with your cartridge at the ranges you are interested in. Once that is determined, you are pretty much stuck using that magnification if you need to make a long shot, forcing you to use a variable power scope as a fixed power one. I am not a big fan of that scenario. I think that magnification setting should be chosen based on the conditions (like lighting) and holdover points should work at all magnifications. However, opinions differ. STEP 2. Determine the general attributes you need in a reticle in order to work for you application. STEP 2A. If in step 1 above you decided that you only need the reticle as an aiming point, you need to think a little bit about the type of targets you plan to engage. For a big game hunter, the target is usually fairly large even when looked at from 300 yards (and most people should really try to get a lot closer to the animal than that). On the other hand, lighting conditions might be absolutely atrocious, so a highly visible reticle is a must. That implies that the reticle should be fairly thick. That makes it not ideal for shooting groups, but much easier to pick up in a hurry. An alternative approach is to have a thin reticle that is illuminated. However, then you need to remember to turn the illumination on (unless it is a Trijicon, but that is a different story) and you end up relying on batteries. Make sure you have bold reticle you can see in any light, with or without illumination, is cheap insurance. For a varmint shooter, the target is often pretty small and fairly far away. Having a thick reticle might not be optimal because it can block too much of your target. On the other hand you might still end up in some reasonably unfavorable lighting conditions, so the reticle can not be too thin either. You want something in between. Perhaps, a reticle with very thin lines right at the center, but something a little thicker around it so that you do not lose the sight of it. For this application, you also may consider some sort of a holdover capability in the reticle to be used occasionally when you are forced to take a comparatively long shot and do not have time to twist the knobs. For a target shooter, target size varies,but is often either quite small or quite far 9or both). On top of that, aiming precision is critical for shooting tight groups. Lighting conditions are seldom problematic, so for this situation the thinnest of reticles are often the best ones. STEP 2B. If in step 1 above you decided that you would like to use the reticle for ranging and/or holdover, once again you need to give some thought to what kind of a target you are likely to be engaging and at what distances. For close- to mid-range applications, where a man-size target is assumed, your best bet is a reticle that combines a very visible primary aiming point (for close range applications) with three or four holdover points that work with your cartridge out to 500 yards or thereabouts (think M4-type carbine with a low range 1-4×24 or 1-6×24 variable scope on it). 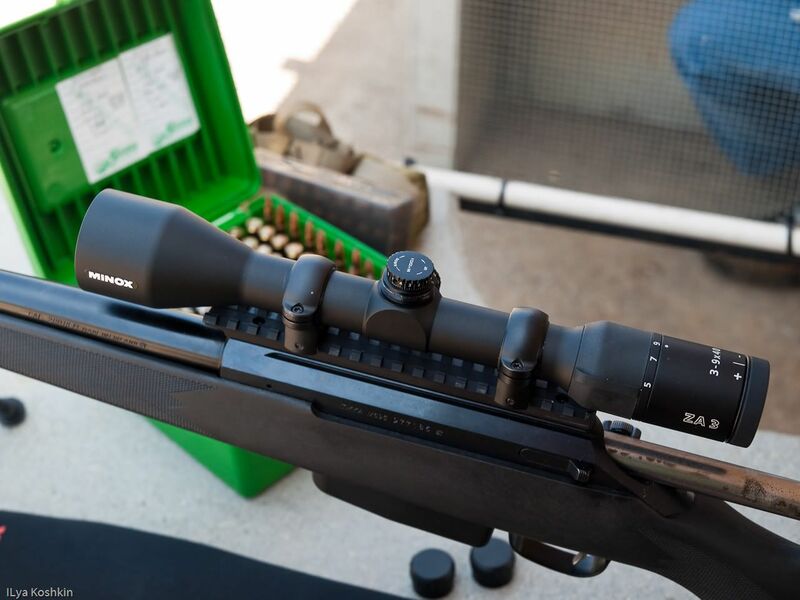 For mid- to long-range applications, where you are likely to be looking at either man-size targets out to very significant distances or at small targets (practical rifle competitions, for example) at distances from a couple of hundred yards and onward, reticles with rather fine aiming points work well. If your primary focus is competition shooting, then you should be putting a bit more emphasis on really thin lines, since you are likely to be dealing with very small targets in decent lighting. If your application is primarily military and law enforcement, then the thinnest reticles might be too dependent on illumination. For most uses, something in between is the best way to go. I have evaluated several version of GRSC scopes that had different generations of this reticle in them and found it to be the fastest general purpose reticle for an M4 type weapon. The large horseshoe is very fast up close while when there is more time, you can use the small circles for very adequate ranging and aiming on human-sized targets out to 800 yards. This reticle has a reasonable combination of thin and thick lines to be useful in any lighting conditions, while the small dot in the center provides for a very fine aiming point. Bottom line is that whichever reticle you choose, try to get some hands on time with it in the field. Something that looks good on paper, might not be optimal in real life, while a design that looks too coarse in theory turns out to work far better than you expected. The answer to this question varies depending on who you ask. I believe that the answer is yes. However, the sweetspot varies depending on the application, and for some applications the range of prices within the sweetspot is quite large. Whether you need at the low end or high end of that sweetspot range is very individual. These days, the market is flooded with competent designs and making a choice all too often is difficult simply because so many competitors are very similar to each other. I make a lot of scope recommendation and the most frequent question I field is something along the lines of: “is this Brand X $600 scope worth the price premium over that Brand Y $400 scope?” Depending on the scopes in question and the application, the answer could be yes, no or maybe. Price alone is not enough information. To make a better recommendation I always have to get into the specifics. Before I dig into this further, however, I think it is worthwhile to say a few words about what I mean by sweetspot. Sweetspot in a given category is where I feel you get the most for your money. Note that I am not saying that more expensive scopes are not worth the investment. Nor am I saying that the less expensive scopes are not worth looking at. In the end, the right choice is very individual. However, I think that the scopes in the sweetspots of their respective market segments are the best way to go for 90% of the people out there. As the old saying goes, if I had a dollar for every time I got asked that question…. Honestly, I do not think there is a direct causal relationship between the price of the rifle and the price of the riflescope. Now, some specific applications virtually require rather expensive rifles and riflescopes, but one does not cause the other. Costs of both are driven by what you wish to use them for. Truly accurate long range rifles tend to be very expensive, and so are the riflescopes designed for long range shooting. The technical complexity of this type of shooting drives the prices up. On the other hand, for some night time hunting at fairly close ranges, the rifle does not necessarily have to be anything very esoteric. As long as it fits the hunter reasonably well, it does not have to be very pretty or super accurate (although neither hurts). After all, you do not need all that much accuracy to hit a 200 pound pig at 40 yards. The scope, on the other hand, may have to be pretty expensive if it is to be used successfully in very low light. I can come up with some other examples that dictate widely varying relationships between the cost of the rifle and the cost of the scope. The bottom line is that when you are trying to select a riflescope, focus on picking something that matches the intended use rather than the cost of your other equipment. After all is said and done, how much should you spend on riflescopes? if your application requires a very feature-rich scope, expect to pay some serious money. if you want to get the most for your money, focus on the fundamentals and forgo too many extra features. You’ll get more for your hard-earned buck. Before I wrap up, it is worthwhile to note that the price there are some very well-made scopes available at prices lower than what I designated as the sweetspot of each category. They are very serviceable and perfectly adequate for most uses. Usually, these are designs that enjoy the economies of scale (i.e. common configurations) and have been made for some time, so the manufacturing yields are likely very high and construction is not very complicated.